I’ve been on two railways ran unattended ATO WITHOUT PLATFORM DOORS. I think one was built new that way, the other converted to unattended ATO train by train, running computer driven and human-driven trains on the SAME tracks and WITHOUT platform doors. It wasn’t a bloodbath. Stations with lower levels of crowding, platform doors are just an extra capital and maintenance cost. Town Hall, on the other hand, needs em now. And if the objective is a more efficient operation without needing drivers, why not unattended ATO ‘deckers? But Bambul Shakibaei, that implies a need to reconnect Bankstown on surface heavy rail to Revesby, a need for interim heavy rail turn-back system at Revesby and that conversion to rapid metro for Eastern suburbs line be restricted to between Bondi Junction and Redfern underground. Interesting ideas @bambul, but I don’t think the numbers quite add up. I just checked the latest TT and Hurstville Starters on Sector 1/T4 are 1/3rd of trains peak, and 0% of trains off-peak. On T8 there are 2 Cambo patterns and 1 Revesby pattern peak, and one Cambo and one Revesby pattern off peak. There is (sort of) provision for more services from extensions of the SWRL if and when these ever eventuate. In short, one track pair isn’t enough capacity for the current combined distance operations beyond Revesby/Hurstville. To me, this idea userlines the problems we have in Sydney. The core problem is inadequate terminal facilities. This necessitates low frequency, high capacity services with simultaneously too many (sharing the same terminal facilities, so infrequent services) and too few (trains have to make too many stops and hence have very long transit times) stopping patterns. The requirement is/remains/and always has been – HR needs 5 sectors instead of 3. *Then*, changes to the form factor and operating practices can be implemented, if they are still considered appropriate. BTW @Bambul, the Airport line could operate as an independent line now, unmodified – if you are prepared to accept a 10min peak frequency (which is all that is currently achieved in peak). No need for platforms 24&25. There is a facing crossover just inside the tunnel portal at Cleveland St. The line could operate from Revesby in and out of redundant surface Platform 23 completely sectorised, the limit being how quickly trains can be turned at Central. A fully automated system could turn trains like a regular stop, so 6 min frequency would be possible. The ESR can run independently, unmodified too: Central to BJ. But again, to do this you have to sacrifice the line’s other role as Sector 1/T4’s terminal facility. Driverless metro – a worthless exercise in job destroying, union busting and a Trojan Horse for absurd, corruption driven slum building – nothing else. The function of metros and heavy rail is different. 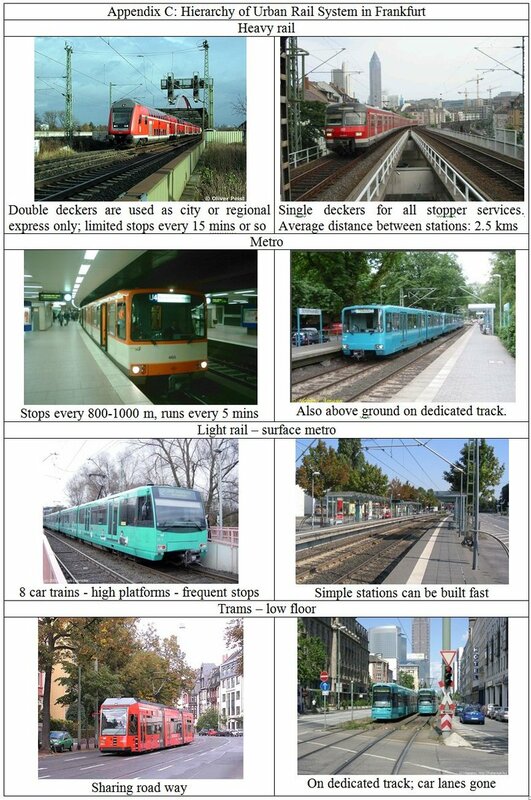 Heavy rail stops every 2.5 km or so and metros stop every 1,000 m, requiring a high density environment as we know from European cities. Example of Frankfurt – although much smaller in size. Metros usually perform a feeder role to heavy rail and/or create connectivity between heavy rail lines having been built in radial patterns during the steam age. Converting heavy rail to metro trains does not make these lines metro lines. 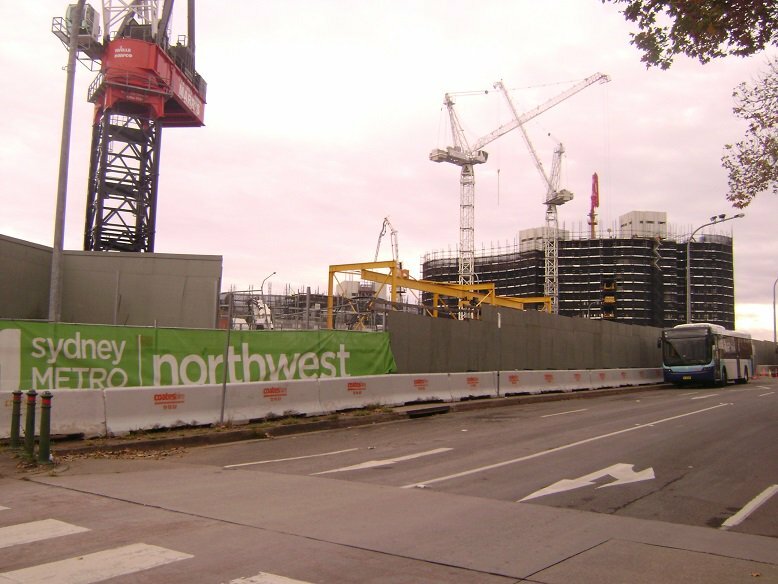 Because of this fundamental design flaw Sydney’s metro project will fail. when the housing boom crashes. We see all these high rises being built around stations. These are to replace the low density surrounds. Therefore, this metro does not solve the oil dependency problem of Sydney’s motorists. It caters for immigrants yet to arrive and who are used to apartment living in Hong Kong, Shanghai or Seoul. I call Gladys Metro therefore an immigration metro. Narural population growth is modest. I personally have nothing against single deck heavy rail stock but minimum condition is they have the same width of 3.04 m and the same door height as the double deckers. After all the red rattlers had them running side by side. The North West metro uses 2.9 m wide cars, yet another incompatibility problem. 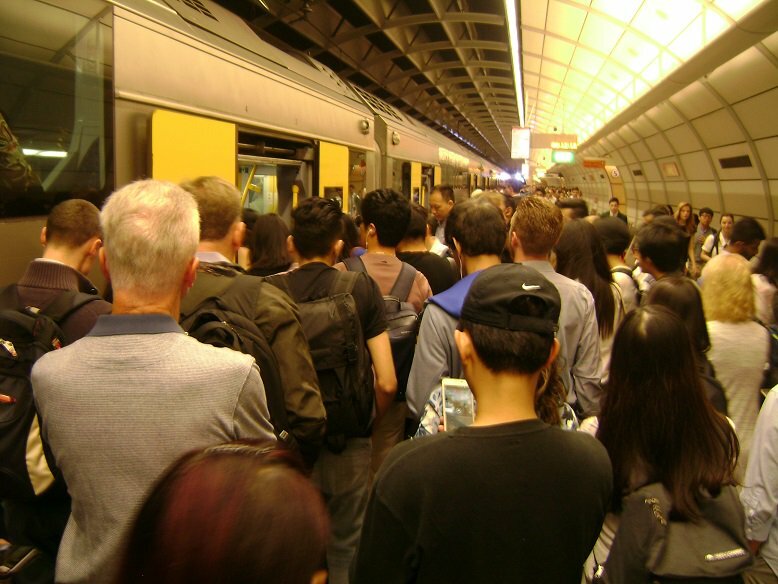 Wait for next year’s stupid Epping – Chatswood rail tunnel closure. It is childish to think buses can take the load of double deckers in peak hour. Revesby wouldn’t require additional turn-back platforms – there’s 4 platforms already, and the outer ones are aligned with the express via Sydenham tracks already. The stopping pattern for most services on T8 now is relatively well aligned with this, given that trains from Campbeltown are running express between Revesby & Wolli Creek. The need for an additional changeover platform at Wolli Creek is also dubious if you’ve already got Revesby as a crossover point, as well as Sydenham for the T4 line. I’m not a fan of converting any further parts of the existing Sydney Trains’ network to metro operation. I don’t even support the conversion of the Bankstown Line, but that’s history now. What’s the point of it? The money would be better spent on new independent metro lines to areas of the inner city, say within a 20-25km radius of the CBD, not currently serviced by rail. It would still be possible to achieve the independent operation of various lines as you’ve suggested, with some track amplifications, without the need to convert to metro and without the disruption and complex operation during the conversion phase. Dare I say it, you could also have compatible SD trains on the all stations inner city lines. I don’t subscribe to the view that a “metro” conversion is the magic bullet. It’s not necessary. 2. You don’t have to close the lines to do it. And now to play trainsets… What possible use would a metro line from Revesby to Central via the airport be? 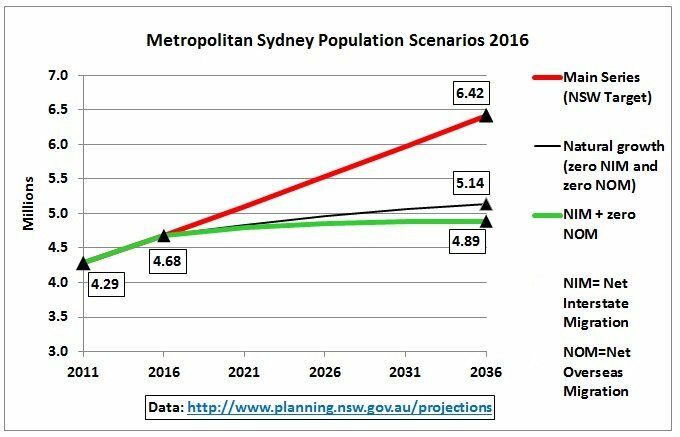 Continuing the through-the-looking-glass topsy-turvy world of NSW transport planning where you catch a metro for the the outer-suburban low density bit of the journey and transfer to heavy rail suburban trains to finish your journey into the CBD and other high density bits of the city. @JC: I think it’s possible, just very much more expensive to do this properly. For example, you can install old and new signalling systems side by side but this takes quite a long time and requires complex interfacing between the two systems. 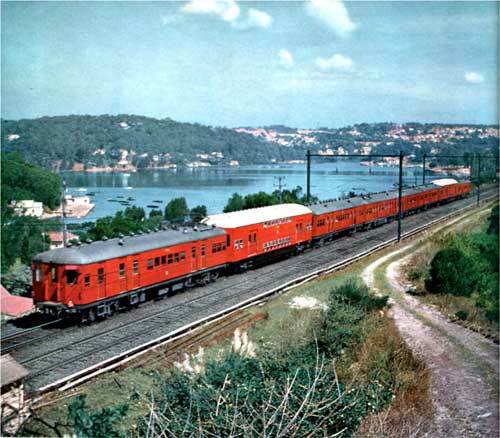 @mushalik: ignore the fancy marketing name, it’s single deck heavy rail (as shown at top right of your picture). Where is this document saying the train width will be different? Your bit about door height is absolutely false as it will need to have cross platform interchange at Chatswood. You are correct about Revesby already having 4 platforms. I must have been getting it confused with East Hills station and its 3 platforms. I’ve put in a correction. Thanks for noticing and pointing out the error. @spamusdet: “Very much more expensive” for who? Closing down a railway for several months imposes considerable costs on hundreds of thousands of people, if you multiply this through it is much greater than the cost of contractors having to work night shifts. If you are replacing the signalling – you have a choice. You can either take the old ones out before you put the new ones in (and close the line for months) or put the new ones in before you take the old ones out – and go live over a weekend. As Bambul points out, the new trains can start without the platform doors – and they could be done one station at a time – so disruption to travellers is only to have to walk/drive/bus a few extra km to the station etc etc. “Going live” over a weekend sounds easy, but really isn’t so. It usually takes years before you’re ready to “switch it over” because they need to find additional time to test this outside of service hours, but they can’t run tests while they’re doing actual track maintenance. An example of these issues was the London Underground Jubilee Line upgrade which ended up taking more than 5 years. As you say, platform screen doors are not as much of an issue if the platform itself is suitable for installation. If not, that will require a further set of strengthening works and modifications to allow for PSD mounting. Suspect the use would be to run more frequent services with lower dwell times at stations, resulting in more useful services, and better service to the airport. @karan. It could also be achieved with compatible SD rolling stock without the need to convert to metro, not that I think it would be warranted anyway. DD trains, if allowed to operate to their specified performance levels and at greater frequency, could more than adequately fulfill the role. The perceived problem of dwell times with DD on this sector are overstated in my view. Let me state this clearly so everyone understands – nothing this government has done with public transport is to “improve” public transport. Everything has been done as a Trojan Horse for property developers to inflict overcrowding and slum building, and to break down the system into sectors so it can be parcelled off to privatised franchise holders. The northwest metro, the conversion of the Bankstown line, and the proposed west metro all parallel tollroads, and in my opinion are intended to restrict public transport capacity to keep high levels of traffic on the tollroads, while, as I stated above, giving the metro promoter – the Hong Kong Mass Transit Railway Co., a property and real estate developer – open slather to build high rise slums. It is driven by corruption, is a rort, and a criminal enterprise intended to inflict maximum damage on areas of Sydney, particularly Sydenham-Bankstown, that will never vote for the liberal party. In the northwest, this bogus undersized metro is intended to keep traffic on the M2 pouring revenue into liberal party donor Transurban, while at the same time opening the gate for massive overdevelopment of high rise.. Even the one good project they have done, the CSELR, is burdened with massively excessive costs – track costs five times much per kilometre as Melbourne, Adelaide or Gold Coast track – and stupid vanity features such as the APS (Amazingly Pricey System) ground level power that will fail when the first heavy rain event floods the track. And, like everything else, is intended to force overdevelopment. That it won’t force “enough” to satisfy developer greed is shown by plans to build another bogus, fraudulent metro to Maroubra Junction. Back in 2011 when this regime of spivs was elected the first response to the extension of light rail to Dulwich Hill from members of the regime such as Duncan Gay was to try and stop it as the road lobby had long coveted that route from Rozelle to Dulwich Hill for a truck road. That move was frustrated, but everything done since with tollroads, metro and slum building has been a malignant blight driven by corruption, greed and ideological contempt for the environment. In Hong Kong, MTR earns back their investment in railway lines by reselling land near these lines the government has sold to them earlier. In Sydney, they do *not* own the land. The government leases the railway for them to run it for 15 years and they don’t get any property development rights. The government reserves the rights for over-station development and they are the ones who will earn the money from them, not HK MTR or any of the Northwest Rapid Transit consortium members. What they do get are contractual performance incentives, where they’ll make a profit if they do run things reliably and to time, while they will be hit with penalties if they do not. If you actually did some study in railway operations, you would understand that sectorisation improves capacity and reliability. Yes, this is at the expense of some one seat journeys, but I don’t think trains continually being late and cascading delays are evidence of a well run operation. Whether they are SD or DD is a different matter. Working out which one is better has to be done on an individual basis as it can be complicated and depends on a lot of factors. If all-stops to Revesby is converted to a high frequency SD service then Revesby WOULD certainly need a turnback. It already needs it now to allow cross-platform interchange. Here’s why. In the new weekend and night timetable the current operations format fails. The all-stops services to Revesby on the T8 leave Central 11 minutes before the following express. They run on separate tracks once they are out of the airport tunnel and are timetabled to connect at the same minute at Revesby. Makes sense on paper given the expresses no longer call at any station between Wolli Creek and Revesby. The express continues its down journey as an all-stops south of Revesby, so interchange is important. But here’s the catch….it mostly doesn’t work. The results are often slapstick comical. The expresses from the airport arrive on platform 4; the all-stops alternate arrivals between platforms 2 and 3. Unless the all-stops is running early you have no hope of changing platforms from platform 2 in time to get to platform 4 to continue your journey. Even if you score the all-stops that is scheduled to arrive on platform 3 the connection often fails by seconds and the expresses continue their journey just as the all-stops pulls in. On-time running aside, the turnback would mean the all-stops would always arrive on platform 3 and would always return to the city from platform 2 to allow for cross-platform interchange in both directions. (There is a timetable tweak available to reduce the number of current fails. The service which is waiting to collect transferring passengers at Revesby in either direction needs to be given an extra 1 minute of flex. That will solve most of the current misses. There isn’t a easy tweak available to connect trains that are running late btw so we shouldn’t try). A turnback is a must to interlace an express and all-stops transfer properly. Incidentally, in this same timetable cross-platform interchange between T8 and T2 and Leppington now works well and every time…although the trains are often sitting too long…up to 3-4 minutes. Therein lies some flex for the Revesby dwell time.